Welcome aboard your latest issue of World of Cruising! If you made a wish-list for the perfect family holiday, where would you start? Sunshine would be a given, followed by lots of thrilling but safe adventures for the kids, some serious R&R for the grown-ups, plenty of amazing sights to see, fabulous food … and something to tear the teens away from their iPods. Now, what does that remind me of? 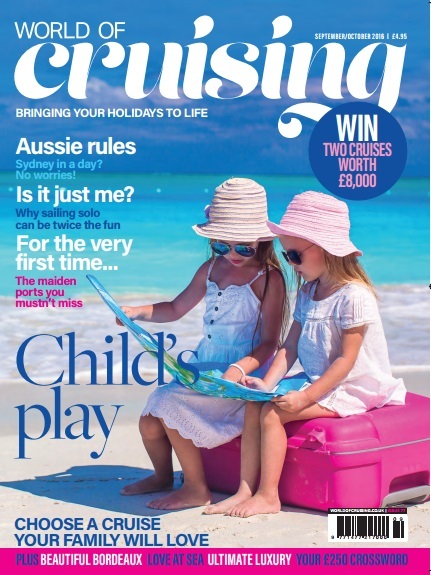 You wouldn’t be reading World of Cruising if you didn’t know the answer, and this month’s issue is bursting with holidays that your nearest and dearest will adore. But cruising isn’t just about family fun. Plenty of people travel solo – or would secretly like to – and we reveal which lines are rolling out the red carpet (and rolling back the supplements) for single travellers. What’s more, you needn’t come back solo if you read our guide to finding love at sea! With all that, plus a look ahead to the new and exciting places your favourite ships will be visiting in 2017, I hope we can help you set sail on the adventure of a lifetime. Happy holidays!